I am digging this post out of last year’s archives! 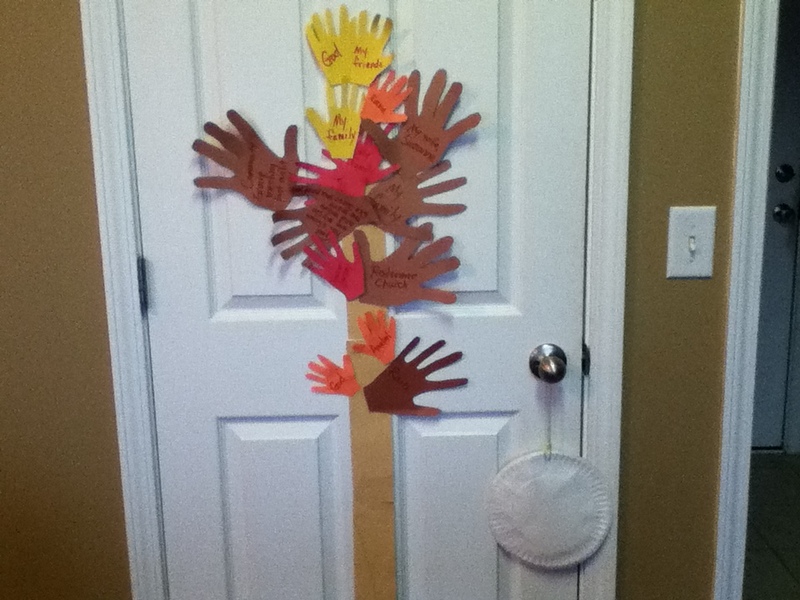 It’s that time of year again–time for our family’s Handprint Thankful Tree! We use this each day in November, and it has become one of my FAVORITE traditions for our family. Over the next two weeks, I’ll be tracing and cutting 30 hands per family member to be ready for November 1. This is VERY simple, but the routine, discipline, cadence of taking each day in November to verbalize something that we thank God for is etching in our sons’ minds and hearts (and their parents) that “Every good gift and every perfect gift is from above, coming down from the Father of lights with whom there is no variation or shadow due to change.” (James 1:17 ESV) A simple, yet monumental tool used to thank and glorify God–I love that about our Handprint Thankful Tree! This will be our third year to have a Handprint Thankful Tree. I haven’t had the heart to throw away our handprints from the past 2 years. I love going through the “old ones” each year when I get out our “tree trunk,” which I store with the previous years’ handprints. First, I almost BAWL my eyes out when I see how tiny my sons’ hands were. (MERCY, I can’t handle how quickly they’re growing up!) After I have a crying session, I read over what was written previously, the things that we were thankful for in the past. It is a blessed reminder of God’s abiding faithfulness to me and our family. Then, my tears start again! I love that traditions help us remember. Which reminds me, are you joining in on this month’s Book Club as we read, “Treasuring God in our Traditions?” If not, you should be! Don’t worry that the month is more than half over; the main point is that you need to read this book–so inspiring, instructive! Read the original post to find instructions for making your own and how our family uses this each November. Also, last year, I wrote an entire series of posts about Thanksgiving, if you are interested, you can read all of the posts by clicking here. And….you guys reading my little blog, I’m thankful for YOU! You’ll be on one of my handprints this year!